These doors are beautiful and easy to install on any shed new or old. They are durable fiberglass doors with a wood grain exterior. They come w/ 11-lite glass inserts in each door. 1 30 1/2" X 72" door, T-handle w/ keyed lock, 3- black strap hinges. These doors are completely maintenance free and easy to install. Shed Doors -N- More is a diverse supplier of fiberglass doors. Included in our mix are Fiberglass doors for the outdoor storage shed market. This segment over the years has evolved from home-made wood doors to steel doors to fiberglass doors. An outdoor shed typically has to endure more hazards than a typical home entry door and survive much harsher weather conditions due to the exposed nature of its application. Shed Doors-N- More has a fiberglass door specifically designed for the outdoor storage shed and at affordable cost. Storage sheds normally houses gardening equipment, recreational vehicles, tools and items that can easily damage or destroy a door. However, with Shed Doors -N- More's fiberglass doors, the damages that normally occur with these items are prevented with our durable fiberglass door. Wood doors can easily be cracked, split or warped whereas steel doors are subject to dinging, denting and rusting. Literally, these types of doors can be destroyed within minutes of use. Shed Doors -N- More's fiberglass doors are immune to all the destructive forces associated with wood and steel doors. They do not rust, warp, dent, ding, crack, split, chip or distort. 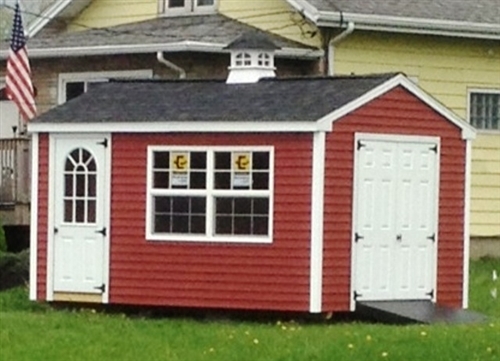 Storage sheds are typically designed without protective features normally associated with entry doors. There are no storm doors, eves, overhangs, awnings or any protective features to guard the door against the weather elements. Shed Doors -N- More's fiberglass doors resist all the elements associated with harsh weather conditions. Only occasional cleaning and painting are necessary to restore the beauty of a shed door.